The C40 Cities Bloomberg Philanthropies Awards are granted annually in five categories and provide global recognition for cities that are demonstrating climate action leadership. 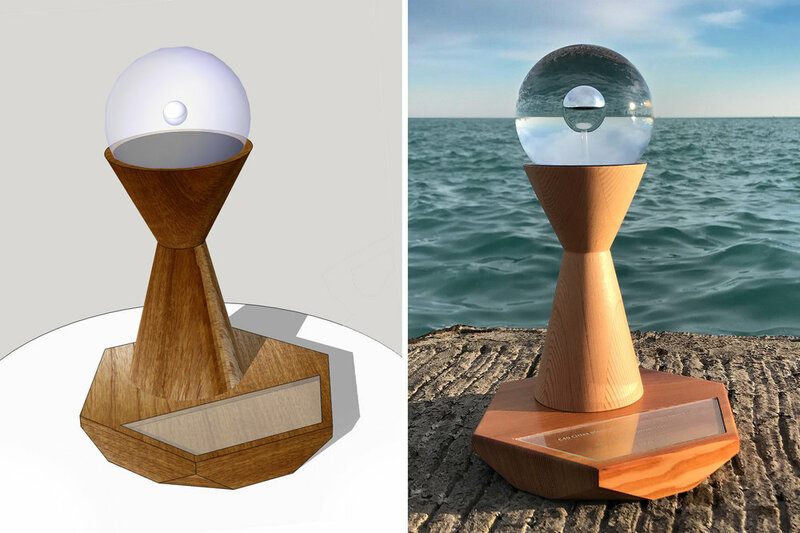 I was commissioned to design and create the awards themselves. My proposal was called Ancient Air. This proposal rendering as imagined weeks prior to being realized. The hand-crafted award contains a bubble of ancient air retrieved from the Pâkitsoq ice margin in Western Greenland. This air is approximately 12,000 years old. Saber-toothed cats roamed the earth at the time it was trapped by successive snowfall and gradually encased in ice. Now it's preserved as a relic from from a time untouched by modern human activity. Climate researchers rely on ice cores to open a window into the past. I travelled to Corvallis, Oregon and worked with renowned Paleoclimatologist Ed Brook at Oregon State University to develop a method to get air from glacial ice cores safely into each award. The ancient air was extracted by placing the ice in a vacuum chamber devoid of modern air. It was then broken apart releasing air from the bubbles within. That air was then pumped out of the chamber and frozen into steel tubes in a helium powered cryostat at a few degrees above absolute zero. When those tubes returned to room temperature the ancient air expanded thereby pressurizing the tubes. Left to right (top): The vacuum chamber with grater to abrade the ice; Prof. Brook explaining the cryostat; Valves used to transfer the ancient air; (below) A larger expanse of lab equipment with the freezer/vacuum on the right and valves leading toward the cryostat (not visible) and a mass spectrometer on the left. Professor Brook shipped those tubes to my studio where I used a method we developed in the lab to release the air in a controlled manner directly into each award before sealing them off for good. The chamber in each glass sphere was first filled entirely with mineral oil which displaced the existing air. Then the ancient air was carefully introduced via a tiny tube, displacing mineral oil as it slowly formed a now captured bubble. The channel was plugged and then sealed with epoxy. The entire journey took place without the ancient gas ever meeting our present day atmosphere. The glacial ice protected the air for millennia and now the glass spheres have taken on that role. They were created by Zak Timan, a gifted artist based in the San Francisco Bay Area. Each sphere is unique and was meticulously formed to house and protect its ancient cargo. Sourcing wood from reclaimed lumber warehouses in northern Illinois. 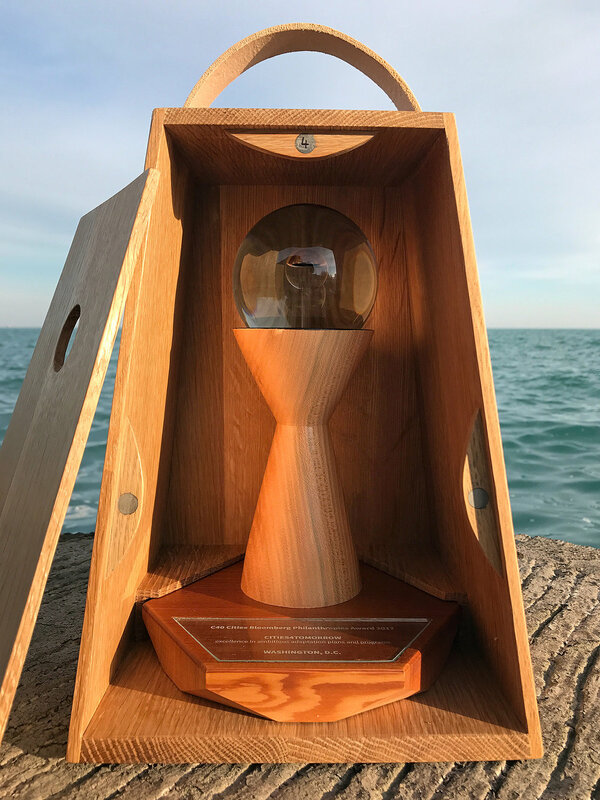 The reclaimed wood in each award dates back to the dawn of the industrial age, when human activity had not yet caused an impending spike in atmospheric CO2 levels. The hexagonal faceted base is inspired by the crystalline structure of ice and the hourglass-like shape of the stem hints at the passage of time. The beautiful white oak carrying cases were built and co-designed by John Preus of Dilettante Studios. My deepest appreciation to my wife Shirin and daughter Azadeh, without whom this would not have been possible. I am so grateful to all those who helped make this project a reality. Presented in no particular order... Taylor Hokanson (thanks for getting me in the door), Mark Twickler and Geoff Hargreaves (National Ice Cores Lab), Siobhan Ruck (thanks for all your support! ), Marcel Gahbauer, Peter Pyle, Nicole Minor, Mary Miller, Donald Fortescue, Ed Brook and Andy Menking and Aron Buffen (OSU), John Preus, Zak Timan, Evan Kolker, Alexander Abajian, Latchezar Boyadjiev, Paula Hooper, Douglas Macayeal and Reika Yokochi (UofC), Peter and Ancina Kitundu, Joanna Haigood, Alice Wingwall, Craig Wildi, and Malia Simonds of Bloomberg Philanthropies. 10 international cities leading the way on climate action received C40 Cities Awards on December 5th, 2017. You are welcome to watch the entire award ceremony in the video below. Live from Chicago, the 2017 C40 Cities Bloomberg Philanthropies Awards at the North American Climate Summit recognize 10 cities' efforts to improve the health of our people, our communities and our planet.